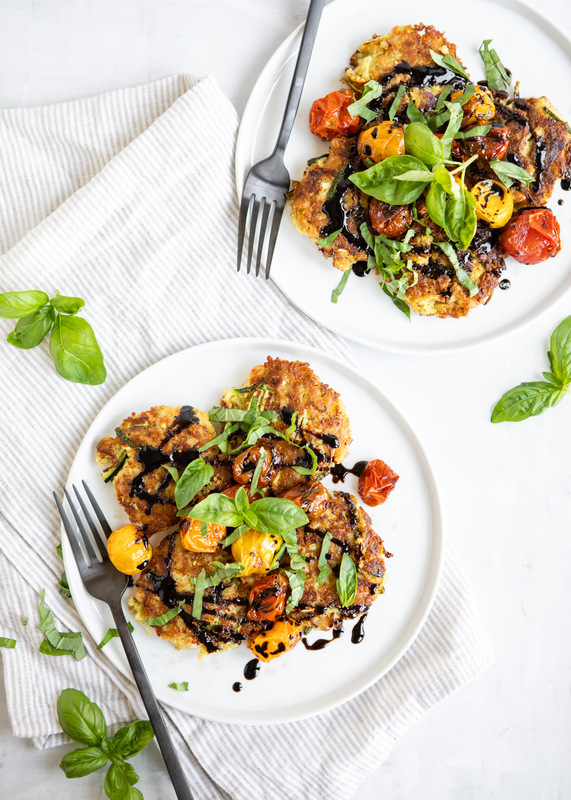 These Quinoa White Bean Zucchini Fritters are everything delicious about summer on a plate. There’s zucchini, found in abundance in all vegetable gardens and farmers markets this month. And cherry tomatoes! Basil too, which is also at its peak right now–it’s the perfect time to harvest it before it starts bolting in the August sun. The only thing that might be missing is corn, but you could totally add that too if you’re feeling ambitious. When I develop recipes, I’m usually pretty mindful of the ingredient list; this one is a little big long, but don’t let it put you off. A lot of the ingredients are things you probably have on hand or can repurpose in other recipes throughout the week. And the rest you can get right from your vegetable garden or CSA box! 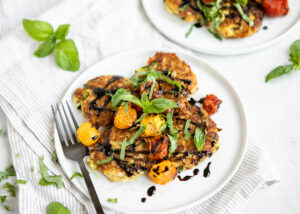 Fritters are often light in the protein department and don’t make much of a meal on their own, but this recipe is a balanced meal–cheese, quinoa, and white beans add protein to the zucchini fritters and the oven-roasted cherry tomatoes round things out by contributing an additional serving of fresh produce. 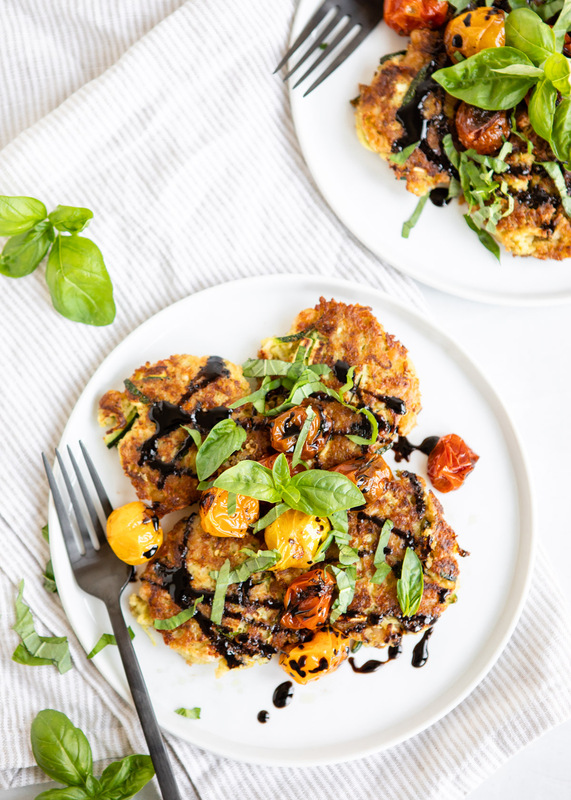 I make variations of these fritters often and in the winter, I sometimes serve them with a good marinara instead of the cherry tomatoes, but since it’s summertime and local tomatoes are in season, don’t skip them! 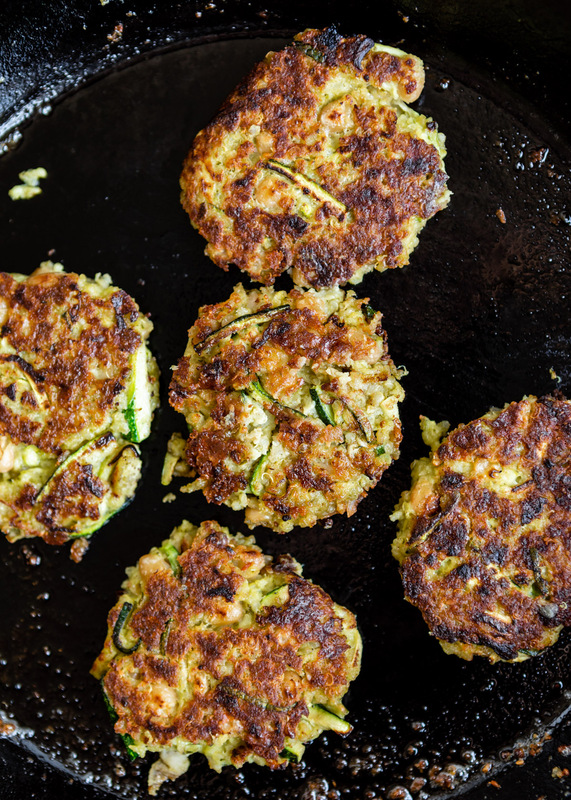 Quinoa, white beans and cheese add protein to these crispy zucchini fritters. Preheat oven to 450°F. Combine the tomatoes and oil on a rimmed baking sheet and toss to combine. Season with salt and pepper. Bake for about 20 minutes, until the tomatoes are blistered and most are burst, stirring once halfway through cooking time. While the tomatoes are roasting, start the fritters. Place the beans in a large bowl and use a fork to mash them a little bit. 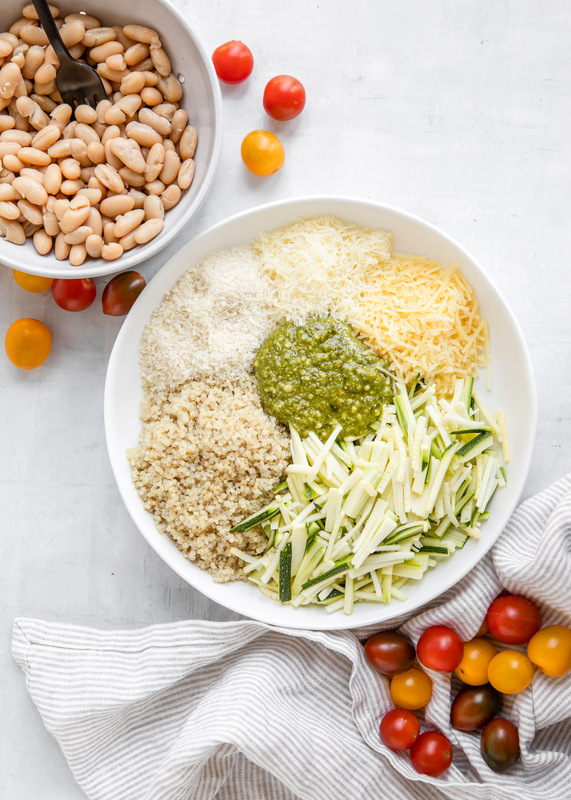 Stir in the cooked quinoa, zucchini, pesto, panko and cheeses. Taste and season with salt and pepper. Fold in the egg. Heat the oil in a large skillet (a well-seasoned cast iron skillet is best!) over medium-high heat. Turn the heat down to medium. Drop 2 tablespoons of the quinoa mixture into the skillet and use a spatula to form it into a fritter. Repeat until you run out of room, but be careful not to crowd the fritters. Cook the fritters for 3-4 minutes on each side, or until browned and crisp. Remove the finished fritters from the skillet and repeat until you use all of the quinoa mixture. Divide the fritters onto plates. Top with the burst cherry tomatoes, basil, and drizzle with balsamic glaze. You can buy balsamic glaze, usually near the balsamic vinegar, at many grocery stores, or you can make your own. If you test the fritter mixture and it's not sticking together, fold in another beaten egg.